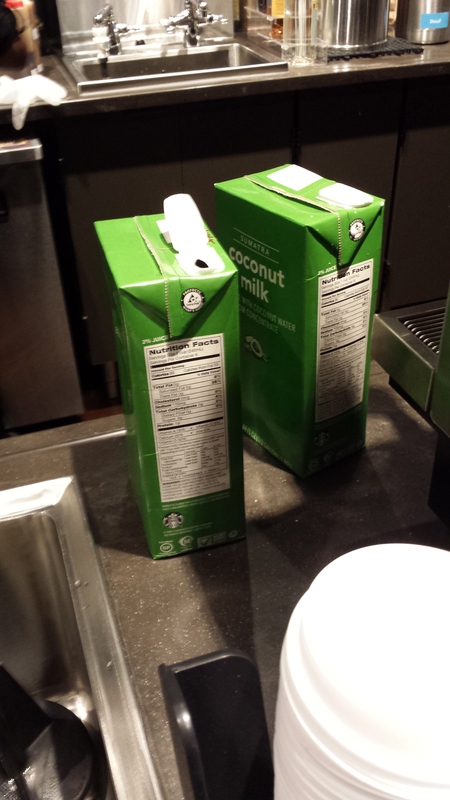 Starbuck’s taste test: coconut or soy? So here I am sitting at the Starbucks on Union Street in East Williamsburg. First things first, it doesn’t look like hipsters are embracing this one or the fairly new Starbucks off Bedford Avenue for that matter. Reason being it’s 8pm and not very busy. When I say hipster I’m talking about the artsy creative types not the bratty pretentious ones. So I’m comfortable, it’s quiet, I have an outlet and actually a heater. I’m happy.. but not about the coconut green tea latte that I came here for – to write round two of this blog experience. Yesterday was the real taste test on the very busy corner of 18th Avenue and 65th Street in Bensonhurst. That’s actually a fun Starbucks with a bar I could sit at. 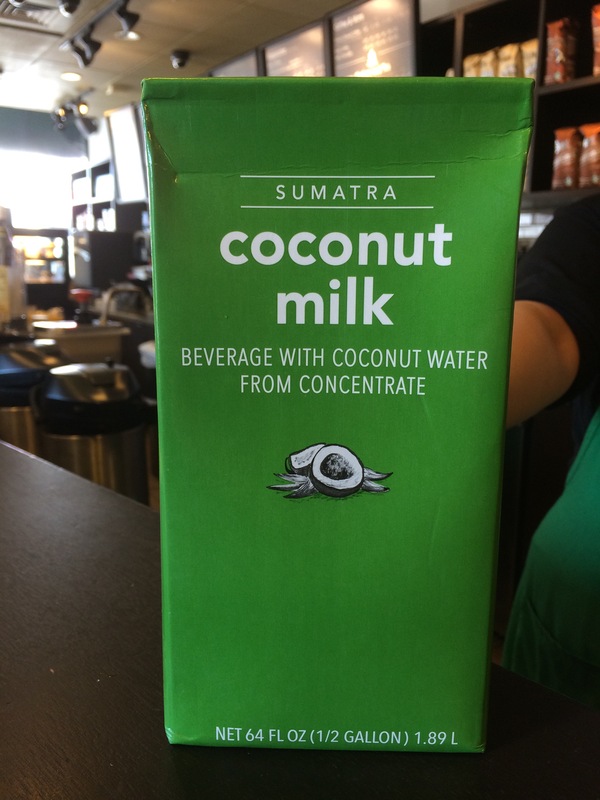 I sat there in a neighborhood where you can’t really buy anything vegan (prove me wrong please), where more than half of the people never heard of drinking commercial coconut milk – only cooking with it and where ten out of ten people who came in didn’t even know it was on the menu at Starbucks. That’s ok. I’m here now. So I order and I take pics. I’m having fun at this Starbucks. 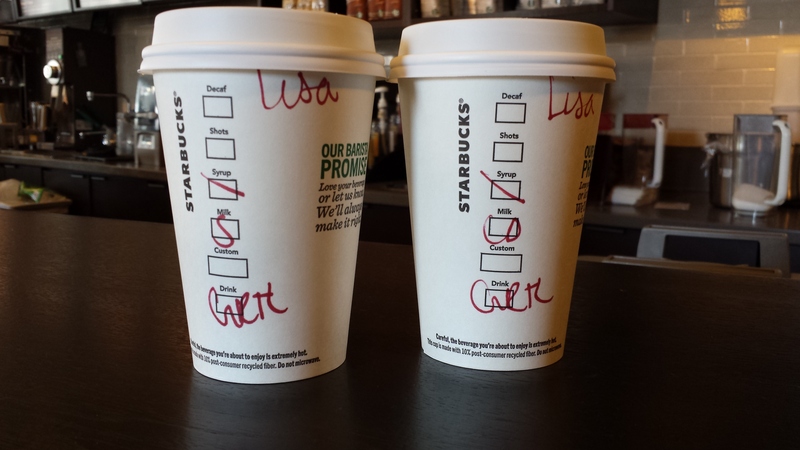 I order my tall green tea latte soy milk unsweetened and then a tall green tea latte coconut milk unsweetened. So why do I say unsweetened last? So that they hear me! I try to minimize my sugar. Actually, truth be told, I’m on a no sugar (low) new year’s resolution with two personal allowances. First, I need organic pure maple syrup in my homemade chocolate avocado mousee. I have dried making my own date paste as a substitute but it’s just not as good – not yet anyway. Send me suggestions please I beg of you. Second, when I’m out and about with friends and want that fun coffee break type of pick me up; it’s in that moment that I then turn to Starbucks for my green tea latte fix. So I allow myself the sugar that’s in the nut milk until perhaps I’m done writing this blog and realize that it’s way too much already. So that’s the thing! I think they add sugar to so many drinks without you even asking or knowing. Hello people – that’s why everything taste so good! It’s loaded with sugar. Many of these drinks are no better than a soda. But that’s another blog for another day. If they don’t hear me say unsweetened, wow can I notice the difference. I unfortunately learned a lot today about the green tea they use too. I’ll get to that in a minute. So I do the test. I’m so excited to try this coconut milk. I’m a vegan hello – I love coconuts. I enjoy the coconut milk, water and the meat for sure. I try my soy milk latte; it’s amazing of course. It’s my go to. Then I try the coconut one. What.. this can’t be true! I go back and forth. I wrote down the first three thoughts for each. My soy milk thoughts: full bodied, sweet, delicious. My coconut thoughts: burnt, thin, different. Ok maybe the barista made it wrong. I’m thinking let me try the milk by itself. She was so nice. The milk is actually delicious. I loved it. Maybe she really did burn it, although I don’t think so since she looked like a pro. My decision was to try it again and so I am as I sit here writing. Just a quick back note here; yesterday I had to drink bitters which rarely ever happens to me. Something really upset my stomach.. hmm! So here I go and no. It just doesn’t taste that good. I’m sorry. Maybe it’s the green tea combination or something with the frothing. Maybe it’s just about getting used to the taste. I wonder how it is with coffee; probably good I would hope. There will be no coffee for me right now. I have cut it out of my diet for a while and now I’m not so sure why I’m drinking this green tea. After much calculating, I realize that this green tea (Matcha powder) is SUGAR. I swear this is a no win. I will eventually go back to some good organic coffee but why does everything have to be so processed? How come everything has to be so secretive too? Don’t get me wrong; I love my teas. I drink regular green tea everyday. I guess you can say this is just a treat. The junk food industry should just embrace it and label it junk. There are enough people who will still eat it. Many people don’t care. I care though. I don’t like the perception of healthy covered in sugar. One Starbucks tall green tea latte soy unsweetened is 10 teaspoons of sugar – just over the suggested allowance of 6 teaspoons of sugar per day. What’s the solution for my Starbucks love and addiction? I’m scared to ask the baristas but I’d like to order tall green tea latte half soy half water unsweetened. Am I being a total pain? I’m sure I am but I’m also sure they encounter difficult people everyday and more importantly, at least I tip well. So my vote is for the soy. Let’s be real- they are both processed, I’m not afraid of phytoestrogens and the soy has more protein and better taste, so why not. For the record, the soy milk is organic and the coconut milk has the non-GMO seal. Best yet, I want to have the Canadian soy milk with less sugar or what everyone wanted to begin with and what has put Dunkin Donuts back on the map in my mind- almond milk! As I am wrapping up this blog post, I’m realizing that I may just ditch the Matcha green tea sugar altogether and retest the coconut milk with a short latte. I think that’s the best idea – I just hope I don’t get addicted to coffee again! Is Trader Joe’s heart healthy?